November 11th 2003 saw a landmark event take place in London. As the first conference designed for quants by quants the Quantitative Finance Review 2003, moved away from the anonymous bazaars that have become the norm, and instead delivered valuable information to market practitioners with the greatest interest. The roster of speakers was phenomenal, ranging from founding fathers to bright young things, discussing the latest developments, with a specific emphasis on the burgeoning field of credit derivatives. You really had to be there. Until now, at least. 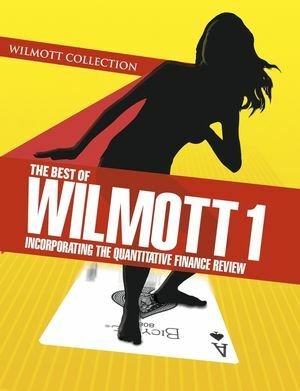 The Best of Wilmott 1: Including the latest research from Quantitative Finance Review 2003 contains these first-class articles, originally presented at the QFR 2003, along with a collection of selected technical papers from Wilmott magazine. In publishing this book we hope to share some of the great insights that, until now, only delegates at QFR 2003 were privy to, and give you some idea why Wilmott magazine is the most talked about periodical in the market. And as they say at the end of (most) Bond movies The Best of Wilmott... will return on an annual basis. Dr Paul Wilmott has been described by the Financial Times as the cult derivatives lecturer. He has for many years been a financial consultant specializing in derivatives, risk management and quantitative finance. He is the author of the best-selling Paul Wilmott Introduces Quantitative Finance (Wiley 2000) and Paul Wilmott on Quantitative Finance (Wiley 2001). He has written over 100 research articles on finance and mathematics. Dr Wilmott runs www.wilmott.com, the popular quantitative finance community website, the quant magazine Wilmott, and is the Course Director for the Certificate in Quantitative Finance, www.7city.com/cqf. Paul Wilmott is a partner in a statistical arbitrage hedge fund. I. Education in Quantitative Finance (Riaz Ahmad). III, Quantitative Finance Review 2003 (Dan Tudball). Chapter 2: In for the Count (Dan Tudball). Chapter 3: A Perspective on Quantitative Finance: Models for Beating the Market (Ed Thorp). Chapter 4: Psychology in Financial Markets (Henri&euml;tte Prast). Chapter 5: Credit Risk Appraisal: From the Firm Structural Approach to Modern Probabilistic Methodologies (Hugues E. Pirotte Sp&eacute;der). Chapter 6: Modelling and Measuring Sovereign Credit Risk (Ephraim Clark). Chapter 7: The Equity-to-credit Problem (or the Story of Calibration, Co-calibration and Re-calibration) (Elie Ayache). Chapter 8: Measuring Country Risk as Implied Volatility (Ephraim Clark). Chapter 9: Next Generation Models for Convertible Bonds with Credit Risk (E. Ayache, P. A. Forsyth and K. R. Vetzal). Chapter 10: First to Default Swaps (Antony Penaud and James Selfe). Chapter 12: Sovereign Debt Default Risk: Quantifying the (Un)Willingness to Pay (Ephraim Clark). Chapter 13: Chord of Association (Aaron Brown). Chapter 14: Introducing Variety in Risk Management (Fabrizio Lillo, Rosario N. Mantegna, Jean-Philippe Bouchaud and Marc Potters). Chapter 15: Alternative Large Risks Hedging Strategies for Options (F. Selmi and Jean-Philippe Bouchaud). Chapter 16: On Exercising American Options: The Risk of Making More Money than You Expected (Hyungsok Ahn and Paul Wilmott). Chapter 17: Phi-alpha Optimal Portfolios and Extreme Risk Management (R. Douglas Martin, Svetlozar (Zari) Rachev, and Frederic Siboulet). Chapter 18: Managing Smile Risk (Patrick S. Hagan, Deep Kumar, Andrew S. Lesniewski and Diana E. Woodward). Chapter 19: Adjusters: Turning Good Prices into Great Prices (Patrick S. Hagan). Chapter 20: Convexity Conundrums: Pricing CMS Swaps, Caps, and Floors (Patrick S. Hagan). Chapter 21: Mind the Cap (Peter J&auml;ckel). Chapter 22: The Art and Science of Curve Building (Owen Walsh). Chapter 23: Stochastic Volatility Models: Past, Present and Future (Peter J&auml;ckel). Chapter 24: Cliquet Options and Volatility Models (Paul Wilmott). Chapter 25: Long Memory and Regime Shifts in Asset Volatility (Jonathan Kinlay). Chapter 26: Heston’s Stochastic Volatility Model: Implementation, Calibration and Some Extensions (Sergei Mikhailov and Ulrich N&ouml;gel). Chapter 27: Forward-start Options in Stochastic Volatility Models (Vladimir Lucic). Chapter 28: Stochastic Volatility and Mean-variance Analysis (Hyungsok Ahn and Paul Wilmott).